After achieving independence from Spain an autonomous concert and opera life developed in Argentina, in many respects trained in European traditions: Astor Piazolla, the founder of the Tango Nuevo, should be mentioned here, as well as Mauricio Kagel, Carlos Gardel and finally the personality that has been considered for decades the great man of classical-style music in the South American country: Alberto Ginastera. Three of the works recorded here fall into this final period, the ‘Neo-Expressionist’ one. The Concerto per corde op. 33 (1965), held in the classical four movements, Estudios sinfonicos op. 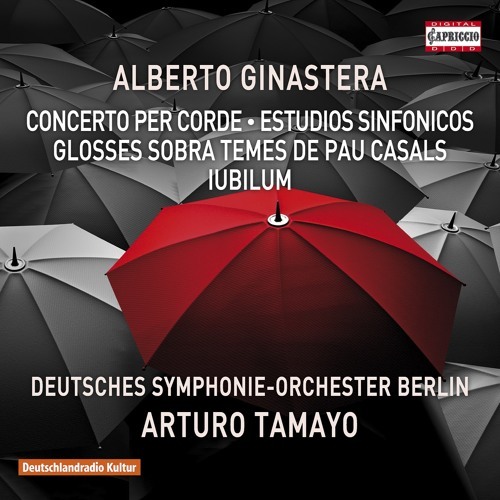 35 (1967), one of Ginaster’s orchestral works experimenting furthest with sytlistic devices of the avant-garde and a special position within the works of the third period is taken by the Glosses sobra temes de Pau Casals op. 48 (1976/77), as it takes recourse to very traditional material – themes by the great Spanish cellist Pablo Casals – treating it in a kind of reflection in an avant-garde mirror.